Allspice originates from a wild evergreen tree indigenous to the rainforests of South and Central America. This spice is named for its aroma -- a combination of the spice scents including cinnamon, cloves, ginger and nutmeg. Among several purported benefits, allspice components may help ease digestive problems, reduce pain, fight disease-causing pathogens and improve circulation. As with any natural remedy, consult your doctor before using allspice. Allspice -- often called pimento due to the Spanish mistakenly thinking it was a pepper, or pimienta -- may benefit digestion. The eugenol components of allspice’s fruit not only provide an unusual aroma but supposedly can also ease digestive symptoms such as diarrhea, nausea and vomiting. In addition, allspice may provide carminative, or gas-reducing, effects. This fragrant spice purportedly acts as a relaxant to aid stomach cramps and conversely acts as a stimulant to aid digestion. Though believed useful, scientific evidence is insufficient to prove the effectiveness of allspice for the treatment of digestive disorders. Components in allspice may act as an anesthetic to numb pain. The tannins, or plant-derived chemicals, in this peppercorn-looking spice can reportedly relieve arthritis and sore muscles when used as poultice on the skin or as a bath oil. In addition, a study published in the November 2010 journal “Phytotherapy Research” observed the effects of eugenol on neuropathic, or nerve, pain in rats. Eugenol was injected into the lumbar spinal cord of rats with induced neuropathic pain. Researchers discovered that eugenol helped alleviate nerve pain in the rats. However, additional scientific evidence is needed to prove the effectiveness of allspice components for easing pain in humans. Allspice oil may help kill disease-causing germs on food. Research published in the August 2009 edition of the “Journal of Food Science” observed the physical and antimicrobial effects of allspice, cinnamon and clove bud oils against salmonella enterica, Escherichia coli and listeria monocytogenes. Research findings indicated that all three spice oils produced activity against the three food-borne pathogens. In addition, researchers concluded that the essential oils from allspice and other plant-based foods can help protect foods against pathogenic bacterial contamination. This flavor-enhancing spice also masks unpleasant odors and has other beneficial properties. 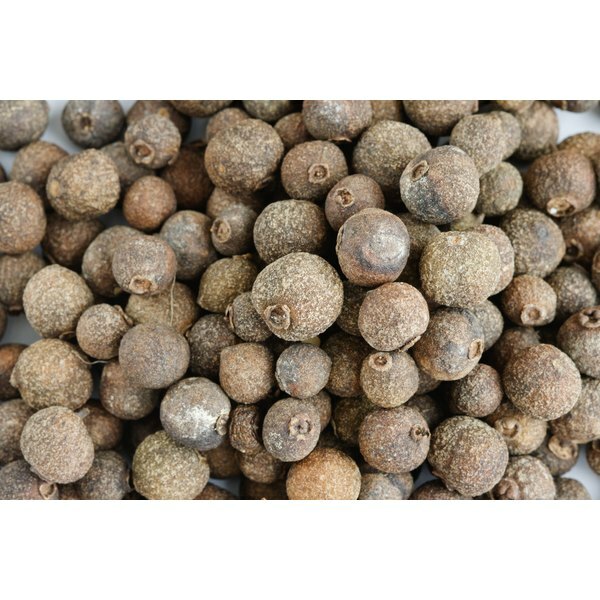 Allspice exhibits antioxidant properties in the fight against disease-causing free-radicals. Traditionally, this spice has been used to treat bacterial and fungal infections as well as coughs, chills, bronchitis and depression.